Thank you for your interest in learning more about TeamMates and how it can benefit your student! Check out the information below to learn more about TeamMates and how you can support your student’s relationship with his or her mentor. If you have questions or concerns, you can find the contact information for the Program Coordinator in your student’s school district on TeamMates Chapter pages. TeamMates is a one-to-one, school-based mentoring program that matches youth in grades 3-12 with a volunteer adult mentor. Mentors serve as a role model, friend, champion, coach, or guide. Your student’s TeamMates mentor will take a personal interest in the growth and development of your student and will meet with your student until he or she graduates from high school if possible. Mentors and mentees meet once each week during regular school hours at the student’s school. Mentors should not have contact with your student outside of school unless they are in high school and have your written permission to do so. Any meetings outside of school, such as TeamMates Graduation Celebrations, must be approved by you. If you have any concerns about your student’s mentoring relationship, you can call the TeamMates Safety & Ethics Hotline (1-888-788-7727) at any time. How do I know that TeamMates is safe? Safety is one of TeamMates core values and we take multiple steps to ensure your child will remain safe throughout his or her relationship with a TeamMates mentor. All mentors undergo a thorough screening process, including an application, background check, personal references, and interview process, and must complete an in-person training session prior to being matched with a mentee. Every three years mentors undergo another background check to make sure he or she continues to be a good fit for mentoring your student. What do mentors and mentees do? Mentors and mentees begin by getting to know one another, learning about each other’s interests, talents, likes, and dislikes, often while playing games or engaging in an activity selected by the mentee. Over time, their relationship develops and they may work on setting personal goals, explore future careers, or develop a plan for post-secondary education or training. Regardless of the specific activities, mentors and mentees are encouraged to take a relationship-centered approach to their time together. What is my role as a parent or guardian? Be positive about the relationship and let your student know you are glad he or she has a mentor. Ask your student open-ended questions about how things are going with his or her mentor. Sign and completed any needed paperwork in a timely manner so that your student can join the program or participate in any special group activities. Remember that the mentor is there specifically for your student and respect the time he or she is giving to the mentoring relationship. What else should I know about TeamMates? 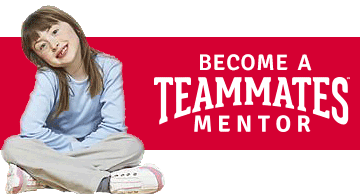 To learn more about TeamMates, read through the Guide to TeamMates Mentoring Program for Parents and Guardians. It covers the topics above in more detail and provides additional information related to TeamMates and mentoring. If you have other questions after reading the guide, please feel free to reach out to the Program Coordinator for your student’s school district. His or her contact information can be found on the TeamMates Chapter Pages. TeamMates+ Mentoring is a program designed to work with students as they pursue their post-secondary education by giving them support and encouragement on a monthly basis. TeamMates+ Mentoring allows the continuation of the same mentor/ mentee match from high school or matches a community volunteer with a college student to serve as a one-to-one mentor. As a TeamMates+ match, mentees will meet with their mentor once a month instead of once a week on campus or off campus in a public setting. The role of a TeamMates+ Mentor is to support their mentee with resources and personal experience as their student explore and pursue their major and career path. They become an advocate of their Strengths, potential, and well-being. The role of a TeamMates+ Mentee is to allow their Mentor to support them with school, relationships, soft skill development, time management, and career readiness. To continue in the program as a TeamMates+ Mentee, please complete our TeamMates+ Mentoring Application (for Mentees). If you have not participated in TeamMates and would like to have a TeamMates+ Mentor while pursuing your post-secondary education, please complete our Standard TeamMates+ Mentoring Application and JOIN THE TEAM! If you have any additional questions regarding our TeamMates+ Mentoring Program, please contact Jaci McKeever.